Electrical utility companies use a pricing model called Critical Peak Pricing (CPP) where the cost per kilowatt-hour varies depending on the time of day. This pricing model charges a premium or higher rate during times of peak energy usage, such as during the hot afternoon in the summer. 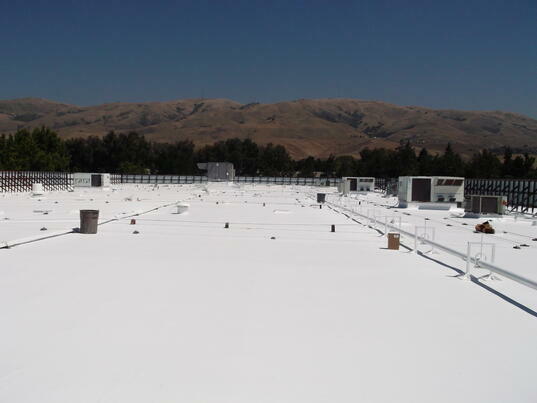 White roof coatings provide an easy and cost effective way to reduce your building’s air conditioning usage, which will in turn, lower your electricity costs. Using a highly reflective, white roof coating redirects the sun’s heat away from the building, back into the atmosphere. This allows the building to remain cooler while absorbing only a minimal amount of heat into the structure. Therefore, during peak energy periods where energy usage cost is higher, you won’t need to use your air conditioning as often or for as long in order to achieve a cool, indoor air temperature for your employees and customers. 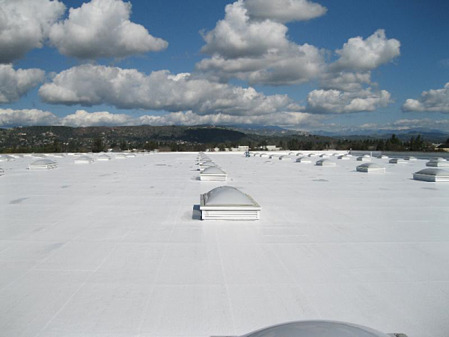 There are several white roof coatings available in the roofing industry, it is important to research the reflective capabilities the coating is able to provide initially and at 3 years. The Cool Roof Rating Council (CRRC) tests and rates reflective roofing products to provide consultants and building owners with these initial and 3 year unbiased results. National Coatings' reflective roof coatings have been tested and rated by the CRRC to prove and guarantee that our top coats provide industry leading UV protection, longevity and brightness. They are formulated for superior dirt pick-up resistance and protection against biological attack, such as algae and mold. For a list of our CRRC rated products, click here. For more information on our Cool Roof Coating Systems and Products, download our FREE Product and Application Brochure! The sun is your roof’s worst enemy. The intense heat and UV rays are the leading causes of blisters, splitting and roof decay. These sun-related issues create leaks, potentially threatening the contents inside the building. Installing one of the Cool Roofing Systems described below would prevent sunlight degradation, protecting your roof and extending its lifespan. Cool Roofing Systems decrease roof maintenance costs and extend the life span of the roof beyond traditional roofing due to their highly reflective and emissive qualities. Inside the building of a Cool Roof, temperatures remain lower and fluctuate less. This results in a greater overall comfort for employees, tenants, and customers with or without air conditioning. National Coatings has Cool Roof Systems which use AcryShield roof coatings that contain zero VOC's (volatile organic compounds) or very low amounts of VOC’s depending on your roofs needs. These coatings contain no harmful or strong odors. Cool Roof Systems also improve the environment as they decrease emissions in the atmosphere by cutting down on air-conditioning usage. Cool Roofing - What is a Cool Roof? A cool roof has the ability to reflect a majority of the sun’s heat away from the rooftop and radiate the small percentage of heat absorbed by the roof's surface back into the atmosphere. Today, cool roofs come in a variety of different colors; however, a bright white surfaced rooftop has the ability to reflect the greatest amount of sunlight away from the building. The concept is similar to wearing a light colored shirt versus a dark colored shirt. The shirt with the lighter color will allow you to remain cooler on a hot day apposed to a dark colored shirt that will absorb the heat; therefore, making you hotter. Cool roofs are favored by building tenants and owners because they are able to keep the inside air temperature of the building cooler without using the air conditioning system as often. This is an excellent way for tenants and building owners to save a great amount of money on their energy utility bills and put less stress on their HVAC equipment, allowing them to last longer. The Cool Roof Rating Council or CRRC is an excellent independent, non-biased organization that has established a system for providing Building Code Bodies, Energy Service Providers, Architects & Specifiers, Property Owners and Community Planners with accurate radiative property data on roof surfaces that may improve the energy efficiency of buildings while positively impacting our environment. They determine the “coolness” of a roofing product based on Solar Reflectance (SR) the portion of the suns’ heat that is reflected by the roof and Thermal Emittance (TE) the capability the roof surface has to radiate the heat absorbed by the roof. The CRRC records initial testing values and aged (3-year) testing values to determine the reflectivity the product in question is able to perform. Visit their website (http://coolroofs.org) for a complete directory of rated products ranging from asphalt roofing, roof coatings, single-plies, metal and more. National Coatings has nineteen fluid-applied, highly reflective roof coatings that have been tested and rated by the CRRC. 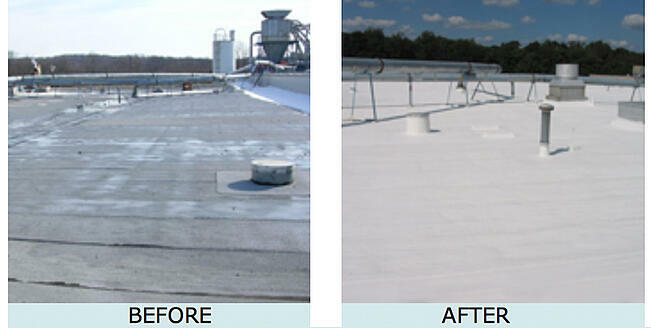 Our AcryShield roof coatings are some of the highest rated products listed in the directory for solar reflectance, thermal emittance and SRI (Solar Reflectance Index, the measure of solar reflectance and thermal emittance which is used as a guide to determine how much solar heat the roof is capable of discarding). For a full listing of our Cool Roof Rating Council Compliant Products, click here.